This 36 inch by 52 inch stove board is made with an attractive design that is sure to accent any type of fireplace. With this stove board, you can get the protection that is needed to eliminate damage caused by your fireplace. The durable construction extends the protection of your hearth and creates a beautiful functioning piece that is easily installed. In just a few seconds, you can have an effective protection in your home that protects your flooring from ashes, heat, or sparks put off by any type of fireplace. Can this board be used under a pellet heater? Can you lay this product on top of the carpet? 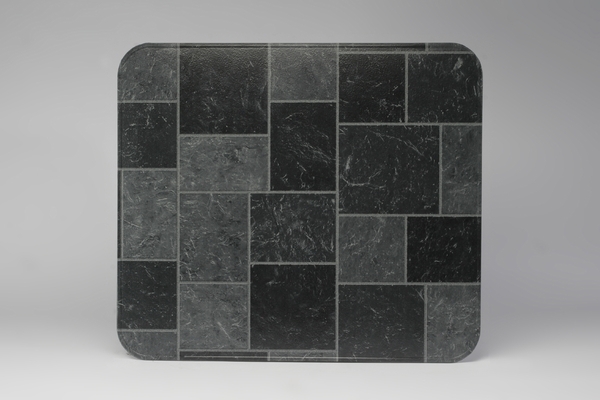 For best results, the Type 2 HY-C Stove Board should be installed on a flat solid surface. Carpet and padding should be removed before installing the stove board. Can this be used for a coal stoker stove? As long as the stove does not require a higher R value than the 1.56 value this board provides, you can certainly use this item. How thick is this stove board? Per the manufacturer, this board is 5/8 of an inch thick. Can this floor pad be put on a wood floor under a wood stove? As long as the stove you are using does not require a floor protector with an R value greater than 1.56, this product can indeed be used to protect the combustible flooring beneath. Does the stove stand on this, or is this for the wall behind the stove? This stove board is designed to be set under the stove as well as mounted to the wall. We also offer the Wall Spacer Kit for Hy-C UL Lined Floor Protectors or Wall Shields when attaching these stove boards to a wall.